Play Caribbean Holidays online for free now! Summer, sun, sunshine: In Caribbean Holidays, the holiday feeling is perfect, for you're partying in beautiful southern climates! Fly high on 5 reels and up to 20 win lines and raise your holiday budget with Twists! So, what are you waiting for? Sit back, relax and enjoy your short stay with a cocktail and the soothing sounds of the seaside - our one-armed-bandit will do the rest! 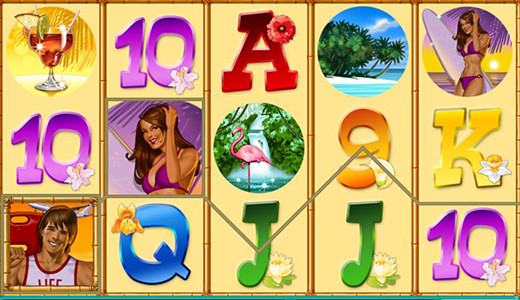 Land 5 identical symbols along a win line - that's your goal at Caribbean Holidays. Your winning combination have to start on the first reel on the left and run along the win line to the right. The important thing is that the matching symbols lie side by side without any other symbols interfering. 3, 4 or 5 'Planes' trigger 25, 35 or 45 Bonus Games. The Bonus Games automatically use your bet and your number of lines from the last regular game. These settings are used automatically and cannot be altered. All winnings in the Bonus game count double. 3, 4 or 5 'Planes' also trigger 25, 35 or 45 bonus games.